Christon was arrested Monday. Her charges include child endangerment and tampering with physical evidence with the intent to impair a human corpse. 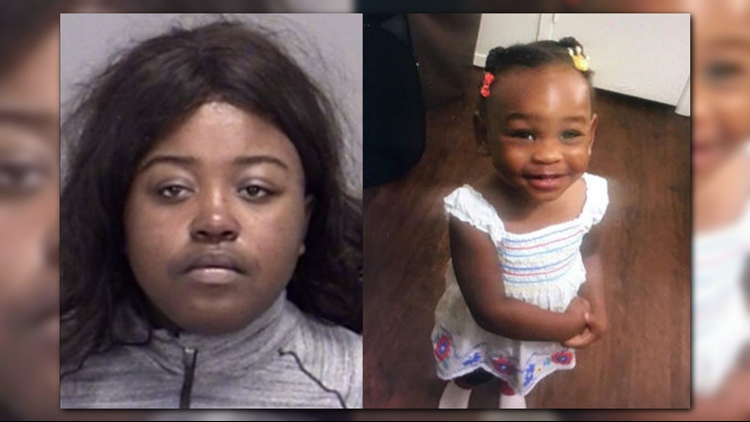 TEXAS -- Tiaundra Christon, the mother of 2 year old Hazana Anderson, admitted to keeping a corpse in her car for three days, according to probable cause statements obtained by KAGS. In statements from the Department of Public Safety, Christon told detectives she and Hewett were in a hotel in Houston from October 17th through October 20th. On October 19th, Christon says Hewett left the hotel with a child to get food. When he returned with the child 30 minutes later, the child was crying and Hewett began beating her with a belt. Hewett also allegedly told Christon to hit the child with the belt, but said she wasn't hitting the child hard enough, so he began beating the child again. Christon says the child was going in and out of consciousness, so she and Hewett put her in the bath tub to attempt to revive her. That night, she says, the child died. Christon told police the child was cold to the touch, so she and Hewett tried to use a hair dryer to warm her up, and while doing so the hair dryer began burning the child's skin. She also said she kept the corpse in the back seat of her car for three days, inside a plastic trash bag. On October 23, Christon says she and Hewett wrapped the bag with the body inside with rope, and tied a heavy rock to it. They then tossed the body into a body of water near Moses Bayou and SH 146 in Galveston County. Christon reported her daughter, 2 year old Hazana Anderson, missing in College Station on October 28th. Police arrested her Monday morning for filing a false police report and child endangerment. A child's body was found by investigators in that area Wednesday night, but the body has not been positively identified.